NuBuiten is a specialist in the garden branche. The company offers a complete product range with over 7.500 different products. From hardwood to custom fencing and decorative paving. To visualize this wide product range, NuBuiten wanted an AR application that could visualize all of these products. "Visualize garden furniture wherever you want"
An iOS application has been created that made this possible. 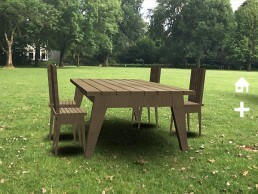 Garden furniture can be placed at any location through AR with the right dimensions. This allows consumers to experience what the product will look like in real life. The colour of the product can be adjusted as well as the materials to make it easier to see what looks best in your garden. Additional options were also added to the application. For example, it is possible to measure in AR, you can add products to your wishlist and an analysis tool has been added. This tool gives NuBuiten more insight into the user behaviour on the app. In addition, a Content Management System has been created through which NuBuiten can add new date. This allows the product range to stay up to date. NuBuiten was really satisfied with the created application. 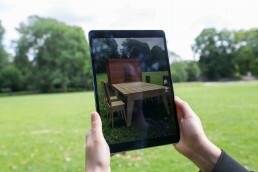 With the application consumers can visualize garden furniture wherever they want. This provides them with a better picture of their potential purchase which simplifies the decision.